BART officials said a family medical leave provision giving its 2,300 union workers up to six weeks of paid time off each year would be too expensive. OAKLAND, Calif. — San Francisco transit officials are calling for a return to the bargaining table, saying an expensive provision was “erroneously” included in a labor contract that settled a union dispute that had caused two recent strikes. 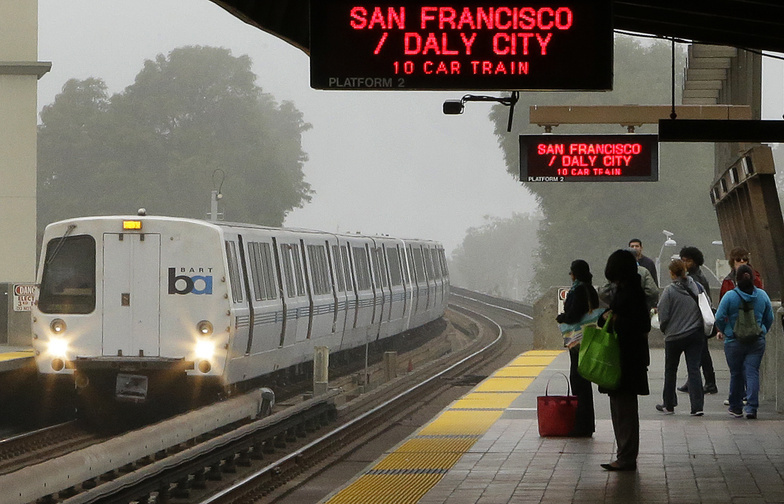 Late Friday, the contract with San Francisco Bay Area Rapid Transit’s two largest unions appeared to be facing uncertainty as the agency said that it was seeking the renewed talks. After a closed-door meeting during the afternoon to discuss the issue and review its likely costs, BART officials said a family medical leave provision giving its 2,300 union workers up to six weeks of paid time off each year would be too expensive. On Thursday, BART officials announced that the provision had been “inadvertently” included in the agreement, which was signed off by transit and union negotiators in October. The board, which is set to vote on the contract Nov. 21, has now ordered the agency’s general manager to restart talks with representatives from the unions — Amalgamated Transit Union Local 1555 and Service Employees International Union Local 1021. A new chief negotiator is expected to be announced. “We are not comfortable with the potential liability that could result from the adoption of this contract provision,” the board said in a statement issued Friday night. It was “never the District’s intention to include the disputed Family Medical Leave Act proposal in the contract,” it added, indicating the medical leave provision was “erroneously” included in the contract language by an unnamed temporary employee in July. By BART’s accounting, 7.4% of its ATU and SEIU workers have taken leaves for family care, at an average of 4.3 weeks and costing about $1.4 million a year. But in its statement Friday, the agency suggested it is worried up to 33% of the union employees might take six weeks of paid leave under the new provision, costing the agency $10.5 million. “The Board is disappointed that this error occurred and was not caught earlier,” it said. SEIU Local 1021 Executive Director Peter Castelli said by telephone Friday that it would likely be a few days before his union made a decision on how to respond. “We’re not ruling anything out, but we’re not inclined to go back to the bargaining table,” Castelli said. BART management and its two largest unions agreed to a tentative deal on Oct. 21 after six months of agonizing negotiations and two strikes that caused headaches for hundreds of thousands of commuters. The disputed proposal would require the agency to provide workers additional paid leave for six of the 12 weeks allowed under the Family Medical Leave Act. Prior contract language required workers to use sick leave and vacation time first. “I had assumed that you would recognize this for the error that it clearly is,” BART counsel Vicki Nuetzel wrote. “As I have stated, given the Union’s positions, (Management) cannot ratify the contract. Board Director James Fang called the error unfortunate. “We’re going to discuss the options and one of them is to not to approve the contract,” Fang said Thursday. Fang said BART management had known about the issue since last week after conducting a final review of the deal, but that board members didn’t find out until Tuesday. ATU Local 1555 President Antonette Bryant criticized the BART decision. “Today, the BART Board of Directors chose to walk away from a deal it negotiated with our attorneys and leaders over a six-month span. On behalf of our riders, our members and the entire Bay Area, we are angered, shocked and disappointed,” Bryant said in a statement released early Saturday. On Friday, Bryant said that the language in the contract was not inadvertent and that the deal is valid. “An agreement is an agreement. BART has buyers’ remorse,” Bryant said. “Now that we have a deal, BART managers think they made a mistake, but they could have and should have identified that long before 2,300 union members voted on the new contract. “We feel that this is a valid contract,” Bryant concluded. If the board votes down the contract on Nov. 21, the unions may consider going on strike for the third time in three months. SEIU’s Castelli questioned BART officials’ competence and good faith.